On Thursday this week, the first Republican US presidential primary debate is scheduled and only the top ten candidates based on average polling numbers will be invited onto the stage. Today, Donald Trump leads the polls by a wide margin. As I’ve been following the news about the race, I’ve watched countless journalists dismiss the candidacy of Donald Trump. News stories continue to talk about him as a fringe candidate who will be out of the race very soon. There’s a smugness going around about Trump as a pretender while those who served as Senator or Governor are more legitimate. There’s no doubt that these pundits are underestimating Trump’s power as a real-time communicator. I looked at each of the candidates’ popularity on Twitter based on the number of followers and calculated a percentage as a proxy for voting. To calculate, first I added up all the Twitter followers of the 16 top candidates to come up with the total number of followers (ignoring that some people follow more than one of the candidates). This is my proxy for total votes. Then I divided each candidate’s number of followers by the total to get their percentage. 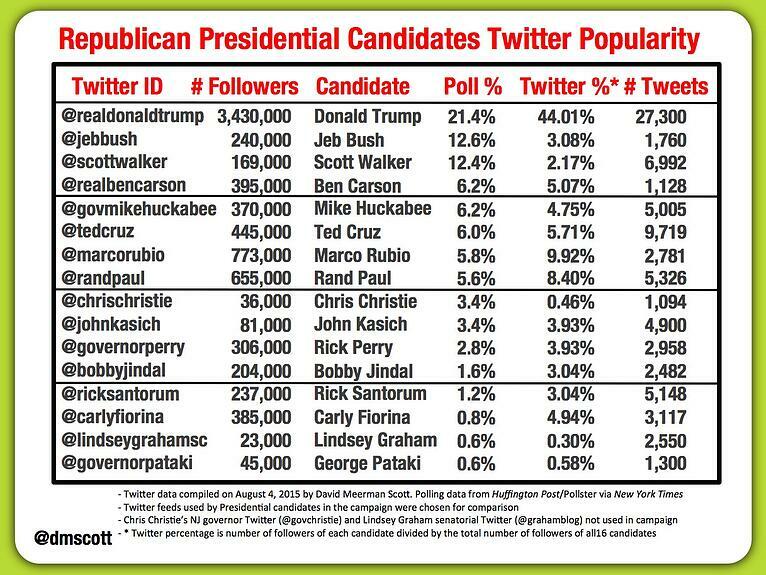 Donald Trump - @realdonaldtrump with 3.4 million followers - is way out in front based on this measure. Trump has four times the number of followers of anyone else. Many of these social networking followers represent supporters of the Trump presidential bid. I’m not sure how reporters can overlook this obvious measure of popularity. In particular, it is interesting to compare Twitter popularity with the current polling numbers. Then I looked at the total number of tweets as a proxy for the level of each candidates' engagement in social networking. Since he started on Twitter in 2009, Donald Trump has tweeted 27,300 times which is nearly three times as many tweets as the next most prolific who is Ted Cruz with 9,719. 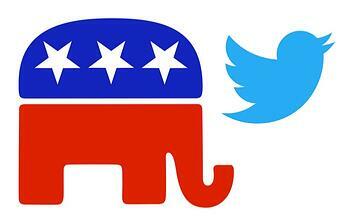 The average of all candidates is 5222 tweets. Donald Trump has the best command of real time communications of the candidates. I find it fascinating how Trump uses Twitter to say whatever is on his mind while it seems like the other candidates have their tweets written by campaign operatives. I sense a fear of saying the wrong thing by the other contenders vs letting loose by Trump. The other candidates tweet out well-researched positions designed to appeal to as many people as possible while Trump doesn’t mind offending while he says what he thinks. In a world where big brands control messages, authenticity wins. Just ask the organizers of Boston 2024 about that one - the Boston Olympic bid was squashed by authenticity on social media. And then there are the Trump detractors who say he isn’t serious. Have they not taken a look at his official site? He’s in it. And he’s running a professional campaign. Important note: This is a marketing blog, not a political blog. I am not commenting on Trump’s nor any other candidate’s views on the issues. I write about the US Presidential election because it is a massive marketing case study playing out for several years, not because I support any candidate over another.